NOTIFICATION: State Bank of India (SBI) inviting online applications for filling up 8904 vacant posts of Junior Associate (Customer Support & Sales) including backlog vacancies from eligible and interested willing candidates. It is latest & good information for unemployed personnel those who are looking for these new Jobs in Government sector & other organizations. Job seekers, who wish to apply for these vacancies regarding SBI Recruitment 2019, must have passed Graduation or its equivalent in any discipline. Applicant’s upper age should be as per Govt. rules and age relaxation is applicable to all reserved category candidates i.e.SC/ST/OBC/ PWH /Ex Servicemen /Women candidates etc. NO OF VACANCIES: 8904 vacant posts of Junior Associate (Customer Support & Sales) in Clerical cadre in State Bank of India (SBI). EDUCATIONAL QUALIFICATION: A passed of Graduation in any discipline from any recognized University or any equivalent qualification recognized as such by the Central Government. Candidates having integrated dual degree (IDD) certificate should ensure that the date of passing the IDD is on or before 01-01-2018. AGE LIMIT: Candidate’s required age should be in between of 20 - 28 years as on 01-04-2019 i.e candidates must have been born not earlier than 02.04.1991 and 01.04.1999 (both days inclusive). AGE RELAXATION: As per Govt. rules age relaxation is applicable for said post to all reserved category candidates for SBI Clerk 8904 SBI Recruitment 2019 Apply Online for SBI Clerk. PAY SCALE: Rs. 11765-655/3-13730-815/3-16175-980/4-20095-1145/7-28110-2120/1- 30230-1310/1-31450/-. The total starting emoluments of a Clerical Cadre employee payable at Metro like Mumbai will be around Rs.23600/- per month inclusive of D.A. and other allowances at the current rate. Allowances may vary depending upon the place of posting. REQUIRED APPLICATION FEE: For said vacancy a non- refundable application fee is to be paid by the candidates as per rules. Rs. 750/- by General & OBC and Rs. 125/- by ST/SC/ PWD/Ex-servicemen candidates to be paid through online mode by using debit card/ credit card/Internet Banking. 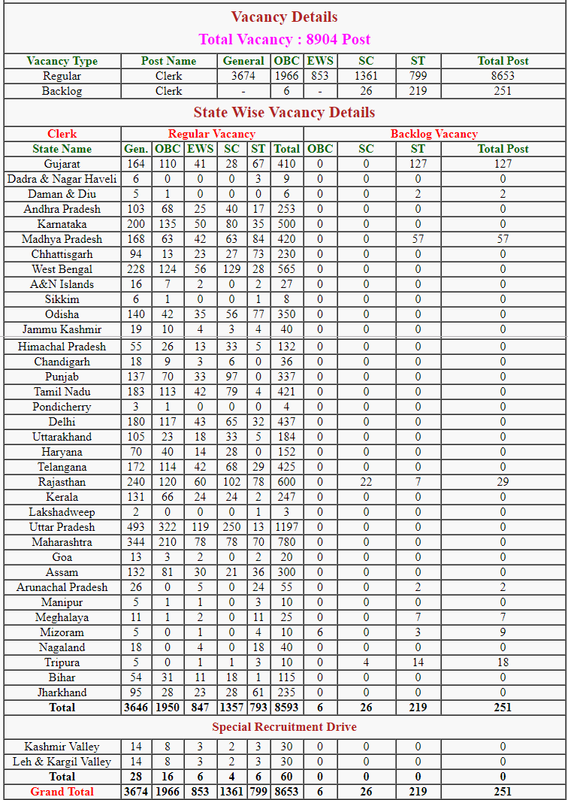 POST RESERVATION: All reserved category candidates i.e. SC/ST/OBC/ PWD/ Women/Ex Servicemen/Widows etc (as applicable) are being selected for said post/s as per existing Govt. policy/rules. Agartala, Agra, Ahmedabad, Aizawl, Akola, Allahabad, Asansol, Aurangabad, Baripada, Bareilly, Bhubaneswar, Berhampur (Ganjam), Bhopal, Bangalore, Chandigarh, Chennai, Coimbatore, Dehradun, Delhi NCR, Dibrugarh, Rajkot, Gangtok, Gorakhpur, Gulbarga, Guwahati, Hubli, Hyderabad, Imphal, Indore, Itanagar, Jabalpur, Jaipur, Jammu, Kanpur, Keonjhar, Kohima, Kolkata, Leh, Lucknow, Madurai, Meerut, Mumbai, Mysore, Nagpur, Panaji (Goa), Patna, Port Blair, Purnea, Pune, Raipur, Ranchi, Ri-Bhoi, Rayagada, Sambalpur, Silchar, Siliguri, Shillong, Srinagar, Tirupati, Tura, Vadodara, Varanasi, Vijayawada, Vishakhapatnam, Surat, Jorhat, Tejpur, Kokrajhar, Thiruvananthapuram, Jeypore (Odisha), Rourkela and Jharsuguda. • Accepting and verifying cash or cheque. • Checking for accuracy in pay orders, drafts, etc. • Preparing Vouchers and also responsible for Customer Support & Sales. • Initial Pay scale Rs. 11,765/- with an annual increment of Rs. 655/-. • After 3 years, Rs. 13,730/-. • After 3 years, it will be Rs. 16,715 /- Rs. 20,095/- after another 4 years. • After another 7 years, your salary will be Rs. 28,110/- and so on. • Maximum salary will reach Rs. 31,450/-. SELECTION PROCESS: Applicants who are screened for applicability/ eligibility are being selected as per organization policy/rules depending on the basis of their performance in on-line test (preliminary & main examinations), test of official and/or local language. NO HARD COPY OF THE CALL LETTER (PRELIMINARY/MAIN) /ACQUAINT YOURSELF BOOKLET WILL BE SENT BY POST. A – Phase I-Preliminary Examination: The candidates should download their call letter and an "acquaint yourself booklet" by entering their registration number and password/date of birth from 1st week of June 2019 onwards (Tentatively). B - Phase II-Main Examination: Candidates qualified for main examination would be able to download their call letter from the Bank's website (following the instructions available on the screen) from 4th week of July 2019 onwards (Tentatively). Candidates are required to score a minimum percentage marks on aggregate (For SC/ST/OBC /PWD /XS candidates, 5% relaxation available thereon). Minimum percentage marks on aggregate will be decided by the bank. No minimum qualifying marks for individual subject are prescribed. Merit list will be drawn State wise, category wise. Candidates qualified in the test (main examination) will be placed according to their aggregate marks in descending order in respective States and Categories. Test of specified opted local language: Those who qualify for selection and produce 10th or 12th standard mark sheet/ certificate evidencing having studied the specified opted local language will not be subjected to any Language test. In case of others (qualified for selection), specified opted local language test will be conducted after provisional selection but before joining. Candidates not found to be proficient in specified opted local language would be disqualified. Provisional Selection (Subject to qualifying specified opted local language): The marks obtained in the Preliminary Examination (Phase-I) will not be added for the selection and only the aggregate marks obtained in Main Examination (Phase- II) will be considered for preparation of the final merit list. Provisional selection will be made on the basis of candidate’s performance in the test (main examination). 1. Verification of eligibility for the post and information furnished in the online application. 2. Qualifying in test of specified opted local language, where applicable, as detailed above. Helpdesk: In case of any problem in filling up the form, payment of fee/intimation charges or receipt of Admission/call letter, queries may be made at telephone no. 022-22820427 (between 11:00 AM to 06:00 PM on working days) or lodge his/her query on http://cgrs.ibps.in. Candidates are advised not to forget to mention ‘Recruitment of Junior Associate-2018’ in the subject of the email. HOW TO APPLY: For said posts (SBI Clerk Recruitment Notification 2019 Apply Online for 8904 Junior Clerk Jobs) eligible, willing and interested candidates may apply through online mode at official website up to last date. Applicants must retain a hard copy for future reference. 1. SBI Clerk 2019 advises the candidates to ensure that they satisfy the eligibility requirements as mentioned above. 2. 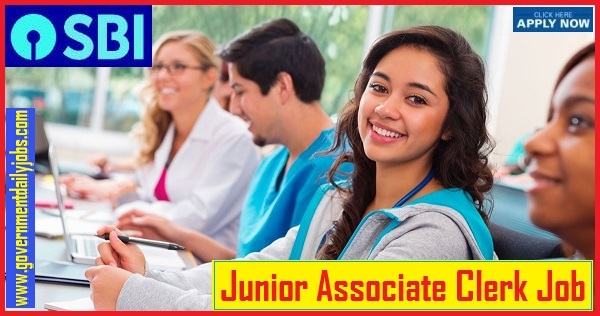 Eligible candidates for the clerical post of “Junior Associate” can apply online from the link provided below. 3. Or the candidates can apply online by visiting the Official Website – sbi.co.in. 4. Choose the desired notification link displayed under “Latest Notification” and click “Apply Online” link. 5. From the loaded page click “New User Sign Up”. 6. Enter the valid credentials of email id and mobile number for registration. 7. Login from the same page using the registered email and password to provide other details like educational qualifications. 9. Make online payment of the application fee. 10. Closing date to submit online application is 3rd May 2019. 11. After successful submission take a printout of the application form for future reference. CONCLUSION: State Bank of India (SBI) Mumbai invites online application for the recruitment of 8904 vacant posts of Junior Associate (Customer Support & Sales), in Clerical cadre on regular basis from Indian residents who are eligible & interested; candidates can apply through online application. SBI Clerk Recruitment 2019: State Bank of India SBI has published SBI clerk Recruitment 2019 notification for the post of Junior Associate (Customer Support & Sales) in clerical cadre. Candidates can apply for vacancies in one State only. Candidates can appear for the test only once under this recruitment project. The candidates applying for vacancies of a particular State, should be proficient (reading, writing, speaking and understanding) in the specified opted local language of that State. Interested candidates may apply online from 12.04.2019 to 03.05.2019 for the post of Clerk (Customer Support & Sales) in State Bank of India. LAST DATE TO APPLY: 03-05-2019 for SBI Clerk Recruitment 2019 | Eligibility, Exam Dates, Application Form.